The National Movement (RN) and the “Freedom” party formed by the veteran libertarian conservative Janusz Korwin-Mikke have formed an alliance ahead of the European Parliamentary elections due in May next year. 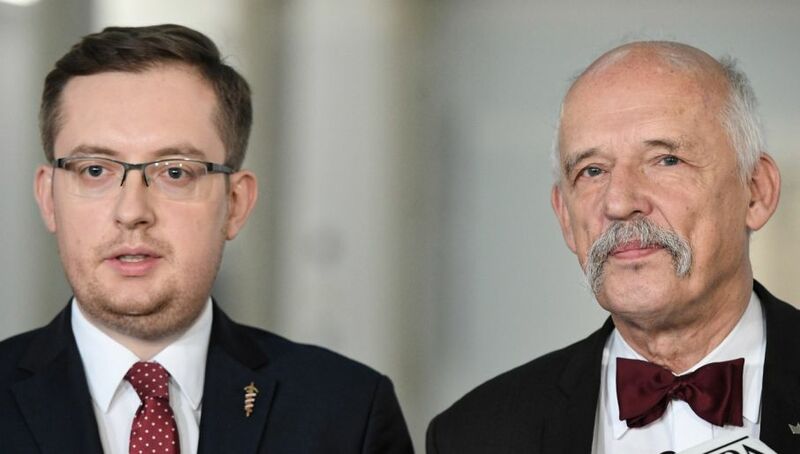 A joint press conference held in the Polish Parliament saw the leader of the RN, Robert Winnicki MP and the leader of “Freedom” Janusz Korwin Mikke, emphasize that what united them was opposition to the European Union and conservative, nationalist and Catholic values. Mr Korwin-Mikke declared that the majority of Poles who supported Polish membership of the EU were “wrong” and that he would work not to reform the EU but to “smash it”. The National Movement (RN) came to prominence as an organizer of the mass independence marches every 11 November, the date Poland regained its independence after over a hundred years of partitions in 1918. It stood candidates on the rock star Paweł Kukiz’s slate in 2015. Robert Winnicki was elected MP but left Mr Kukiz’s parliamentary caucus in 2016. In the local government elections in October, the RN fielded their own slate polling just over 1 percent of the vote. Janusz Korwin-Mikke has been active in Polish politics since 1989. He only got into the Polish Parliament once , in 1991. He also managed to have himself and three other candidates elected to the European Parliament in 2014. He resigned his MEP seat earlier this year to concentrate on his new political venture “Freedom”. That party polled less than 2% in this year’s local government elections. Mr Korwin-Mikke is a colourful character. He is a specialist in cybernetics and an accomplished bridge player. His hallmarks are a beau tie and a penchant for controversy. He has attracted howls of outrage for statements such as his assertion that women are less intelligent than men, that disabled children should not be educated with normal kids and that there was more freedom under Hitler than under the EU. He has supported the Assad regime in Syria and has complemented the Russian President Vladimir Putin. The libertarian conservative has also enjoyed a turbulent private life, married three times and having had 8 children with four different women. Mr Korwin-Mikke still leads a very active life. In the summer he was rescued when swimming out to sea as people on the sea shore feared he might be drowning. Commenting on the incident Mr Korwin-Mikke sighed “what have we come to in this country when a man can’t even drown in peace!”. In the political campaigns ahead of him next year he will get a chance to do a lot of waving, but like all the other political grouping he formed, this latest initiative may well end up drowning.